I’m not going to run through the plot, because the narrative backbone isn’t what makes Inside Out so great; it’s a fairly unsurprising coming-of-age story in line with a lot of Disney movies. No, where Inside Out distinguishes itself from the seemingly endless cycle of family-friendly animated movies is in its decidedly mature themes. The foremost of these is something very few ‘kid’s’ movies tackle in a meaningful way - nor do many Hollywood products in general, really. I’m talking, of course, about sadness. Sadness gets a really bad rap in our society. To cry is to show weakness, to show fear is to be a coward. Real men don’t have emotions, and confidence is proof of competence. That’s all complete bunk. Expressing our emotions is natural. Sadness is a tool we use to let others know that we need their support. Sometimes it’s just not possible to conquer our problems on our own - I know this well from my experience with anxiety and depression. It’s not a sign of weakness to seek assistance from family and friends, nor is it as devastating as it might feel. When I was at my lowest, I didn’t want to burden my family with troubles I felt were mine to bear alone, but when they finally coaxed it out of me, they expressed relief that they could now do something to help me. With all of us on the same page, I no longer had to shutter myself away out of fear of dragging everyone else down, and consequently I was able to take my first steps on the road to recovery. 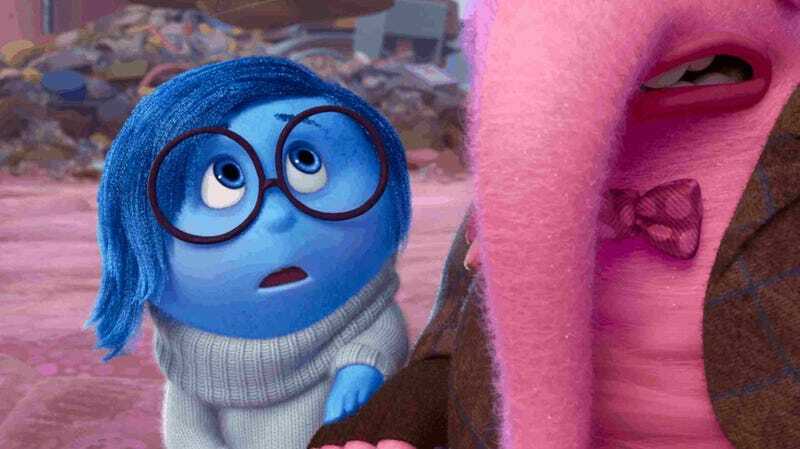 Inside Out, aptly enough, inverts sadness’ bad reputation by making it the unsuspecting hero of the story. For instance, we often look back at our happy childhood memories and reflect on how much better life was back then, but as Inside Out - as well as many psychological studies - shows, those cherished moments aren’t always as pure as we recall. Riley, the main human character in the movie, has fond memories of being feted after a hockey match back in her home town. In a moment of revelation, however, the greater context of the memory comes flooding back, exposing the fact that she had actually lost her team that match by missing a shot on goal, and her teammates had celebrated anyway in order to cheer her up. This mental scrubbing is something our minds do regularly, masking or erasing the blemishes on our halcyon recollections for the sake of protecting our self-image. We don’t notice it, which can be a problem if we linger too long on how inferior the present is to the past. Nostalgia can be comforting, but it’s important to remember that it’s just a highlight reel, not raw footage. No matter how perfect the past may seem, it’s only an illusion. Growing up can be real tough. For Riley, the process is fraught with loss: she loses her old friends, she loses her father to the demands of his work, and she loses her ability to turn every frown upside down. But although she can’t see it at first, learning to let go of the past gives her the strength to embrace the future. By accepting that she can’t run back to her old life, Riley sets her sights forward and focuses on forging new happy memories. Making new friends, joining a new hockey team, discovering a fascination with boys; in bidding farewell to the past, she frees herself to seize the future. Adolescence might be one of the most transformative periods of our lives, but the truth is we never stop growing up. The lessons Riley learns are just as applicable at any age. Bing Bong, Riley’s imaginary childhood friend, yearns to once again play rocket-ship with her, but when he realises his comeback would come at the expense of Riley’s joy, he chooses to sacrifice himself to the graveyard of forgotten memories. This is a price we pay regularly throughout our lives. Memories have to be abandoned, even the happy ones, because clinging too tightly to what’s come and gone only smothers the here and now and all the happiness it contains. Living in the past makes us dead to the present. This phoenix-like rebirth is captured best by the various islands in Riley’s consciousness. Goofball Island, representing Riley’s playfulness, is the first to succumb to the great purge. Then follows Hockey Island, Friendship Island, Honesty Island, and eventually even Family Island. The destruction of these core components of Riley’s character teaches her that nothing is untouchable, no aspect of life immune to unhappiness. Only by accepting and expressing her sadness does she rebuild those islands, bigger, stronger, and more numerous. We experience similar cycles of rebirth many times throughout our lives. Our first rejection in romance, employment, or education hurts something fierce, but each wound only makes us stronger, hardening us us for the next salvo life unloads on us. Our first betrayal teaches us the value of loyalty and the importance of wariness. And the first time we lose a loved one, we learn to really appreciate the time we spend with those we care about. Sadness is a painful but crucial element in growing older and wiser, and we as a society should support, not stigmatise, those in its grasp. Being sad is not an illness; it’s as natural as the exhale accompanying every breath. Riley’s relationship with her parents captures painfully well the social expectations surrounding happiness. Riley’s mum describes her daughter as the glue holding the family together, and in doing so drops an almighty weight on Riley’s shoulders. Suddenly, any admission of sadness means disappointing her parents and destabilising her family, making her misery even worse. This encourages her to bottle up her sadness which ultimately leads to the emotional crash that stops her from feeling anything but anger, fear, and disgust. The same phenomenon occurs at a societal level, where the unwritten rule of suppressing sadness causes many of us to suffer in silence. It’s this prohibition that exacerbates conditions like depression, deterring sufferers from seeking help. The belief that advertising your sadness brings the whole of society down with you is not only complete garbage, it’s actively dangerous; if a depressed individual believes their misery is a burden to others, they cut themselves off and spiral into even deeper depression, seeking release through escapism, isolation, and even death. Treating sadness like an infectious disease only allows it to fester into something much worse. The best cure is social support, as Riley discovers when she reveals her true feelings to her parents. All of us want to help those in need, so why do we still preach that it’s wrong to ask? Inside Out sits up there with Toy Story and The Incredibles as one of my favourite animated movies of all time. It nails the critical cross-generational appeal, entertaining our inner children while simultaneously stimulating our mature minds. The morals of many kid-friendly stories tend to be rather simplistic and naively idyllic, but the message of Inside Out is both refreshingly adult and eminently relevant in day-to-day life. If I had a kid, Inside Out would be vital family viewing. And even if I had to watch it again and again and again as befits childhood obsession, at least it doesn’t have that insufferable song from Frozen in it.